There are thirteen summits inside Philmont Scout Ranch that are listed in the Summits on the Air (SOTA) amateur radio program. There are another three within the Valle Vidal region to the north of the ranch. Only two of these sixteen peaks have been activated by SOTA operators, Baldy Mountain and Shaefers Peak. SOTA is an award scheme for radio amateurs that encourages portable operation in mountainous areas. I think it is a great match for Scouting, combining the outdoors, technology, and world fellowship. Grab a radio, hike to the top of a mountain, and talk to people. 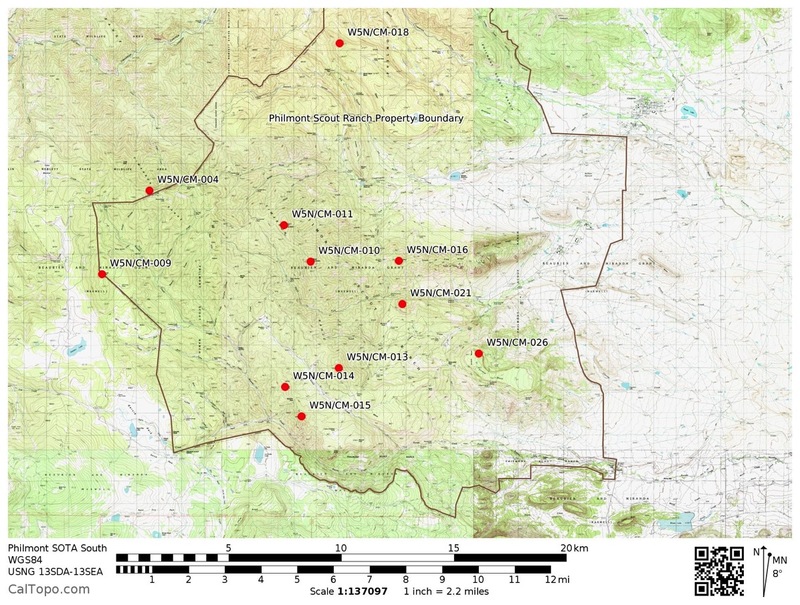 Here is a map of the Philmont South Country, which has most of the SOTA summits. Starting at the north and moving south, these are the SOTA summits. If the summit does not have an official name, SOTA uses the altitude. An unnamed summit that is 8820 feet tall will be “Point 8820”. I used CalTopo.com to make maps with the Philmont boundaries and the SOTA peaks overlaid. CalTopo is a fantastic, free tool for making custom maps. For a modest subscription ($20/year), you can unlock more features. But the free version is still very useful. The PDF maps are geospatial PDFs, so you can use them with a mapping app like Avenza Maps (free). Map of all of Philmont with SOTA peaks, in PDF, JPEG, and on CalTopo. 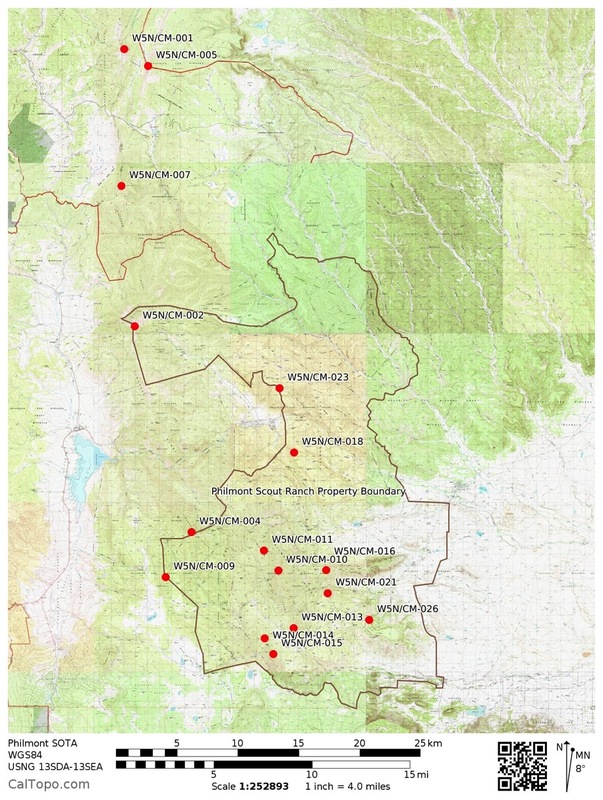 Map of the Valle Vidal with SOTA peaks, in PDF and JPEG. 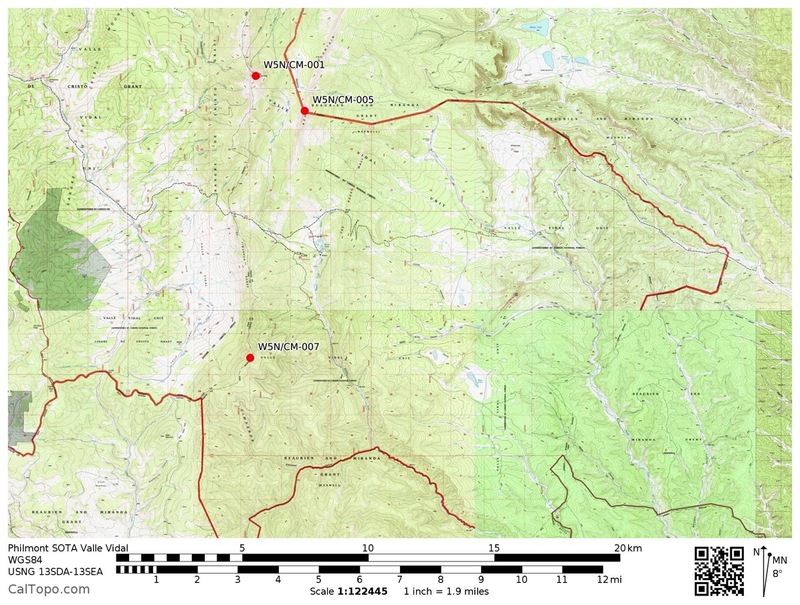 Map of Philmont North Country with SOTA peaks, in PDF and JPEG. 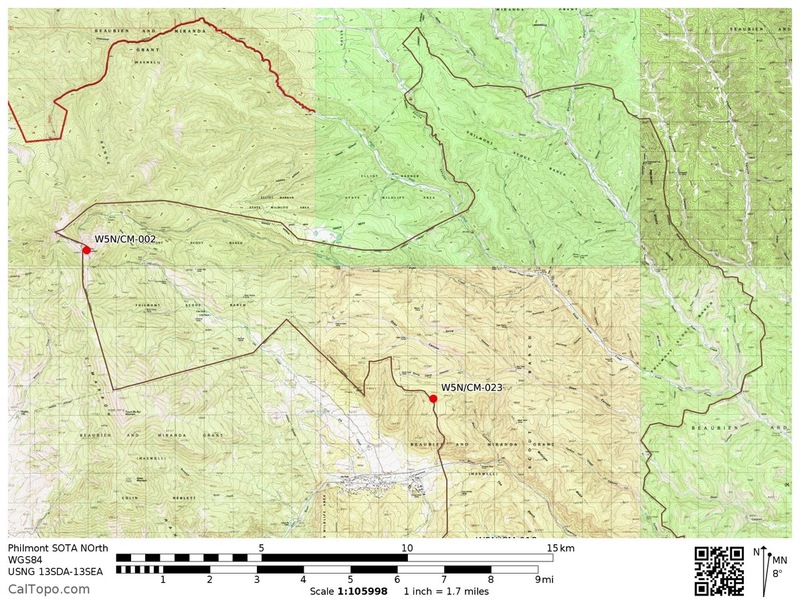 Map of Philmont South Country with SOTA peaks, in PDF and JPEG. I don’t have a ride this year, but I want to go back to Philmont, with a radio! This entry was posted in Amateur Radio, Backpacking & Hiking, Radio Scouting, Scouts BSA. Bookmark the permalink. I contacted Philmont for permission to Activate, and I was specifically turned down. They did not want to encourage unauthorized incursions into private property. Have you any different results? Philmont is just not set up for backcountry visitors. They are busy enough handling 25,000 Scouts per year. During the summer, they have about 4000 participants on the ranch every day. They know where every one of them is, at least to “this camp” or “this trail heading this direction”. You could organize an Autumn Adventure trek. These are after the summer program and can be crews that are all adults. You would need to be a registered member of the BSA, but that isn’t hard or expensive. I would recommend becoming a merit badge counselor for the Radio merit badge. A SOTA trek would be great. I’m glad to connect you with active outdoor Scouters in the Seattle area. Thank you for response. I put in 11 years as an ASM for Troop 626, Bellevue, WA. Both my sons are Eagle Scouts. I went through Philmont with a Crew from 626. Unfortunately this was before SOTA! I would probably enjoy doing another treck through Philmont, but I should do it sooner than later…I’m soon to be 66 years old. I’ve hiked in areas NE of Albuquerque and love it. Been by Philmont but never inside. I’m 70, had a triple bypass last December and have several hikes planned this summer… the SHT in northern MN and the White Mtns of NH along the AT out there. I may even get down to AZ,NM and CO in the fall. Been doing amateur radio for almost 18 months now.